Frankie Four Neck Ties are hand-sewn from a large collection of vintage-inspired stylish polyesters. 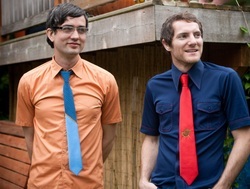 They're fun, unique, and semi casual; not your typical business-man tie. Each tie features a special artistic element, stitching design or accent-fabric diagonal stripe. Custom sizes and designs are encouraged! Contact Frankie Four with specific requests. Frankie Four swim trunks are reminiscent of 1960s swim trunks. Inspired by the movie Gidget, the Swim Trunks are a modern twist on the vintage style. They’re mid-length with a slim fit while remaining flexible and comfortable. The trunks are made from new and vintage stretch polyesters and feature a soft, breathable mesh swim liner. The waistband is elastic in the back and has a drawstring in the front, which creates an adjustable fit. Depending on the style, they feature either a styled single back pocket or two long, functional front pockets sewn on with contrasting stitching.